It is time for us to hop off the fence and share our favourite premium themes with you. 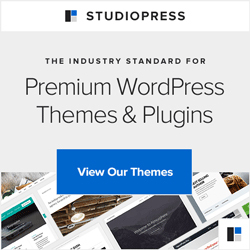 Most of the paid-for options include some amazing themes, and it really does depend on what you want your WordPress blog and/or website to do for you. We especially love working with Genesis from StudioPress and with ElegantThemes. We’ve avoided promoting one particular premium WordPress theme for some time now, but the time has come to change that. And the winner is… well that’s obvious from the title. PageLines was a favourite for some time due to its complete flexibility, but with the change to the new subscription model and theme it was time to review this and consider the trusty established choices. I’ve worked with several premium themes, and still do – they often have their place for their simplicity (Thesis) or when a little quirkiness is wanted (Elegant Themes) but Headway, Thesis and iThemes are rarely used by us now – the former because I just don’t quite “get” it and the latter because it’s too expensive to maintain the developer license, and the middle because I always wanted it to do more. Brian Clark, the founder of Studiopress, is brilliant at marketing and keeping in touch with his customers’ needs. Take a look at any of his sites and the clean layout, the usability, make it a pleasure to visit and makes us want to do the same for our own and for clients. And the Genesis framework is now a treat to work with. We do put the themes through their paces, tweaking and bending them to what you want and rarely using the design “out of the box” – adding different colours, fonts, images and moving things about. For the Blogmistress site we’ve taken the Genesis Mocha theme and changed the background images, the font and some colours, but other than that kept it pretty standard as I feel it will work with what we’re bringing you over the next year or so. I’m using Pagelines for my website which I like a lot but it is sometimes a bit of a pain to get your head round, so I’m interested to see what you think of Genesis. I’m thinking about making a new set of pages over the Christmas break when things are a bit quieter, and wonder how difficult it would be to switch over from Pagelines to Genesis. Is it a faff and how could The Blogmistress help with such a switch? I love(d) working with PageLines and soon got to grips with making it do just about anything we wanted. But the changes they’ve made are a whole different kettle of fish. The old, base PL theme continues to be supported and updated, though, so I keep close watch on that. When I reviewed Genesis again I found a clean basic theme that can be adapted to whatever you want, and of course found this one to bend to what I wanted for Blogmistress – it was actually that quickest design changeover I’ve done for one of my own sites. We should have a natter about what you want to do with your site, and more importantly what it needs to be doing for you, then see if a Genesis theme will provide that for you.